Color is sometimes described as a language, and nowhere is this more true than in the world of data visualization. To build a visualization (that is, a pictorial view of a complicated data set) an artist must define a precise custom meaning for each color. The images here illustrate how the two of us have created specialized languages for different visualizations. In History Flow, a picture of edits on Wikipedia, each author of an article is assigned a color. The stripes and zigzags show the evolution of an encyclopedia entry (here, “Chocolate”) over time. The resulting explosion of color emphasizes the collaborative act of creation. 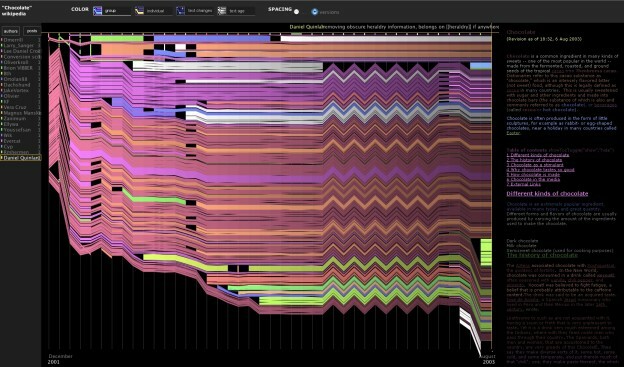 Chromogram is a different kind of visualization of Wikipedia, showing the actions of just one editor. Each colored rectangle is an edit of a different article, and the color stands for the letter of the alphabet that the article starts with. Rainbow sequences indicate edits that follow rigid alphabetical order— indeed this image, so full of rainbows, shows the actions taken by a robot editor. 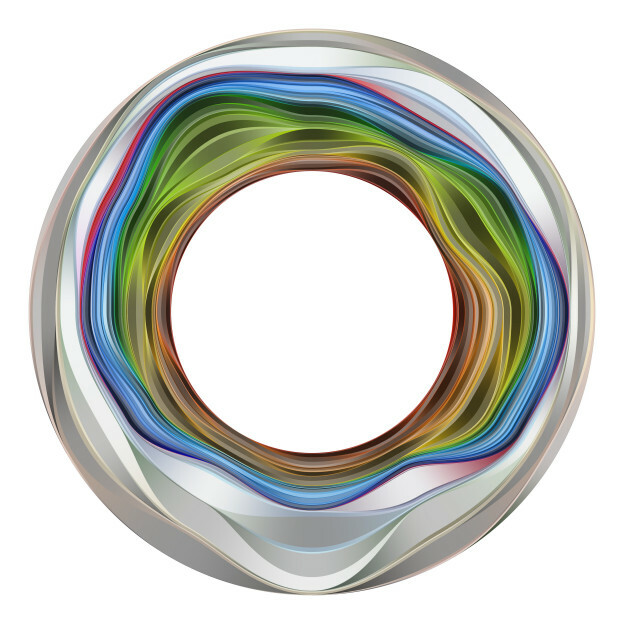 The colorful circles in Bloom represent the ups and downs of tiny movements of the earth. The particular hues are chosen from photographs of flowers, celebrating these small earthquakes as signs of life rather than portents of disaster. 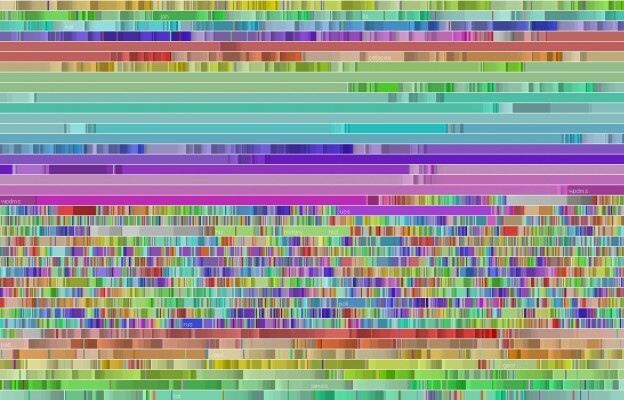 Color Code maps thousands of English words to the average color of the pictures found in an image search for that word. This screenshot shows a close-up of the region of the map corresponding to fruits. The colors derive from blending foreground and background, leading the subtle hues. The color mapping in Flickr Flow is the simplest possible: each color stands for itself. This circle represents a full year (summer at top, fall at right, winter at bottom, spring at left). 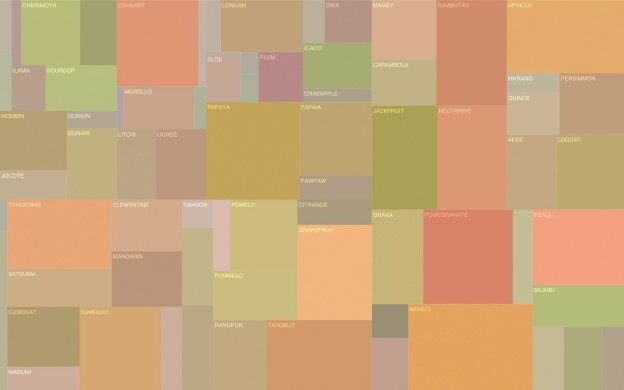 The amount of each color is determined by analyzing hundreds of pictures of Boston. In winter, therefore, whites and grays dominate; in summer, rich greens and blues appear. Our work explores the joy of revelation: the special electricity of seeing a city from the air, of hearing a secret, of watching a lover undress. Our medium is data visualization, a technology developed by computer scientists to extract insights from raw numbers. This technique is ideal for investigating a world represented by digital traces, where truth is hidden in masses of information. The resulting studies take the form of web sites, prints, and videos. At the same time, our artwork complicates and subverts a tool that is largely used by the business and military elite. 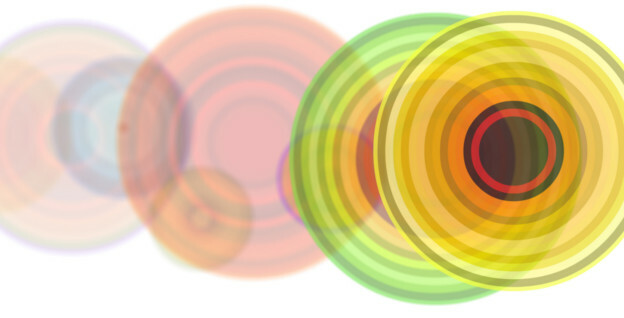 Unlike these traditional uses, we believe visualization to be an expressive medium that invites emotion. We aim our tools at data sets that range from hip hop songs to Walt Whitman’s poetry, from arguments on Wikipedia to expressions of carnal desire. We strive to expand the practical craft of visualization beyond function to create objects of social engagement, pleasure and revelation. Our process is driven by curiosity and a sense of adventure. Data is the starting point, followed by incessant questioning, with a touch of wonderment and laughter. Eventually we start to ask questions that can’t be answered by direct observation. At that point we begin to work in software code, creating a series of digital instruments—telescopes and microscopes of the abstract world—that reveal more than our own eyes can see. As proponents of expressive visualization, we exploit the power of color and complexity to reveal arresting, unintuitive patterns. Parallel to depth of information, clarity and interactivity are of great concern to us. We strive to build intelligible visualizations that engage viewers at a formal level while allowing them to hold a dialogue with the underlying data. It is in this dialogue, we hope, that the brightest sparks of revelation will be found. Fernanda B. Viégas is a computational designer whose work focuses on the social, collaborative, and artistic aspects of information visualization. She is a co-leader, with Martin Wattenberg, of Google’s “Big Picture” data visualization group in Cambridge, MA. Before joining Google, she and Wattenberg founded Flowing Media, Inc., a visualization studio focused on media and consumer-oriented projects. Prior to Flowing Media, they led IBM’s Visual Communication Lab, where they created the ground-breaking public visualization platform Many Eyes, an experiment in open, public data visualization and analysis. Before joining IBM, Viégas’s research at the MIT Media Lab focused on the visualization of online communities. She is known for her pioneering work on depicting chat histories, email archives, and Wikipedia activity. Viégas’s interest in the stories that people tell about these archives led to a series of visualizations of personal, emotionally-charged data. Her artistic visualizations have been exhibited in venues such as the New York Museum of Modern Art, the Boston Institute of Contemporary Art, and the Whitney Museum of American Art. Viégas holds a Ph.D. and M.S. from the Media Lab at MIT. Martin Wattenberg is a computer scientist and artist. He is a co-leader, with Fernanda Viégas, of Google’s “Big Picture” data visualization group. Wattenberg holds a Ph.D. in mathematics from U.C. Berkeley. The collaboration site of Fernanda Viégas and Martin Wattenberg, inventing new ways for people to think and talk about data.